Sooner or later, even the most sensible hi-fi enthusiast starts to wonder what sort of difference having a mains conditioner might make to the sound of their equipment. Mains electricity is the 'fuel' that powers your system. So it stands to reason; the cleaner the fuel, the better things should sound. But then doesn't the power supply in each individual hi-fi component deal with whatever impurities that might be present in the electricity supply? Well, to a degree – yes. But noise and the presence of even small amounts of DC can create all kinds of problems that prevent your equipment from delivering its full performance. 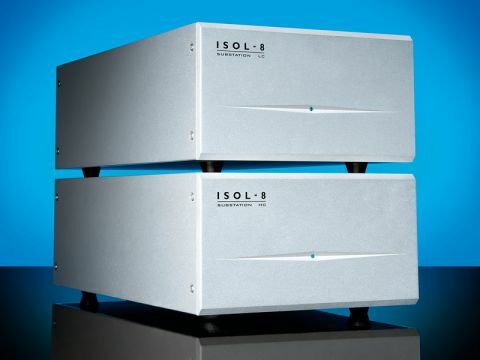 Isol-8 SubStation conditioners are passive 'plug and play' devices. There are no user-adjustments to fiddle with. Some devices (like Isol-8's PowerStation, for example) allow users to alter the frequency of the AC mains from the UK's 50Hz to a higher value. But this isn't possible with the Isol-8 – it's purely a mains cleaner. The design aim is to use inductive/capacitive filtering to reduce mains noise, without compromising current delivery. For example, lots of small 3,300uf electrolytic capacitors are used (18 in the LC and 34 in the HC) rather than a single, large capacitor. This reduces ESR (Equivalent Series Resistance) to less than one milli-ohm. The input has a special choke to reduce common-mode noise and a separate choke is used in the earth line. There are many different types of noise on the mains and the Isol-8 SubStation attempts to deal with all of them to ensure than the output is pure and free from harmful high-frequency noise, DC components, and voltage spikes. You can specify the type of mains socket your SubStation comes fitted with – choosing from either a standard 13-amp UK-type, or a 15-amp Schuko. Both kinds of socket feature a hinged protective cover that prevents dust from contaminating the pins, as well as keeping out tiny fingers! The four sockets on the LC version are individually isolated – each has its own separate filtering network. Some hi-fi components produce self-noise which can get on to the mains supply, affecting the performance of other components. Having each socket individually isolated helps avoid cross-contamination. The HC's two output sockets, on the other hand, are not individually isolated – they draw power from a common source point. The design of the LC and HC versions are broadly similar, but the latter is intended for situations where much greater current delivery is called for – up to 16 amps, compared to the LC's eight amps. To protect against excessive current draw, a press-button circuit-breaker is fitted. This is designed to trip should a certain current threshold be passed. The circuit-breaker can be used as a mains on/off switch, though being situated on the back of the unit means it's a bit awkward to access. Each Isol-8 SubStation is housed in a CNC-milled alloy box. Apparently, full-production samples will feature bitumous damping pads to reduce the risk of case-resonance. But our pre-production Isol-8s were not fitted with them – more on this later. The casework has a brushed surface and looks very smart. Internally, things are neatly laid out with plenty of space between the different groups. Expensive, high-quality components (such as Mundorf flat-wound inductors) are used and the internal wiring features silver-plated copper conductors with PTFE insulation. A high-quality mains cable is included and this connects via a twist and lock Neutrik plug. Given the build quality and high-spec components employed, Isol-8's SubStation conditioners offer very good value. But, 'value' also hinges on how big a difference adding one (or both) makes to the sound of your system. If you're lucky and the mains supply where you live is very pure, improvements might be fairly small. However, the nature of the modern electronic world we live in makes this most unlikely. For the great majority, mains quality is not clean, so having a clean-up device like the Isol-8 SubsStation should prove highly beneficial. Plus – and here's where things get really scary – in the future, problems with mains contamination are likely to get worse rather than better. As electrical devices proliferate, our environment will become increasingly noisy and polluted. Obviously, the degree of improvement you're likely to hear with devices like these depends greatly on how dirty your mains supply is. Many audiophiles find the sound produced by their hi-fi varies according to the time of day. Things often sound best after midnight when people switch off TVs and computers. As a result, the amount of improvement you hear may well alter according to the time of day or night you make the comparison. The dirtier your mains supply, the greater the benefit produced by the Isol-8 SubStation. But, even with relatively 'good' mains, you can expect a cleaner sound, with wider dynamic range and sharper crisper detail. The presence of noise on the mains makes your hi-fi sound slightly muzzy and out of focus. After installing the Isol-8 SubStations, we noticed the music sounds slightly more focused and immediate, with crisper transients and greater depth. The upper treble sounds smoother and cleaner, with less 'edge' and reduced harshness. Listening without the Isol-8s, things definitely become slightly lethargic and less well-separated, with noticeably poorer delineation of detail and dynamics. As a result, we felt inclined to turn up the volume a notch to try and make the music project more. In simple terms, the sound suddenly seems less special. With the Isol-8 SubStations back in circuit, things perked up again. Individual voices and instruments sound cleaner, with greater individuality – both tonally and dynamically. Bass seems firmer and cleaner, with less smearing and overhang, while the treble is airier. There's an innate 'rightness' about the difference produced. It feels like you're hearing your system sound the way it was meant to be – a thick layer of 'grunge' having been removed. This enables you to play things quieter, with no loss of presence, while seemingly allowing greater dynamic headroom for loud peaks. The LC SubStation is very quiet, mechanically – virtually silent – but the HC version produces a 'buzz' with our Musical Fidelity kW750 power amp. Trying the smaller Cayin SP-40M tube power amp in place of the big MF, we found the buzz is greatly reduced. So, the noise level is definitely down to higher current-draw. Speaking to the manufacturer, it seems the cases on our early production review samples had not been fitted with bitumous damping panels and they confidently expect full production Isol-8 SubStations to be virtually silent. The noise actually comes from the wound cores of the inductors creating a sympathetic resonance with the case. Incidentally, we tried the MF power amp with the LC SubStation and to our surprise it works without tripping the circuit breaker. This means that – unless you have a really big power amp that draws huge amounts of current – the LC SubStation may be entirely adequate with most normal-sized amplifiers. Nevertheless, we feel our system sounds slightly better when the MF power amp is being used with the HC SubStation, rather than going through the LC. Both units run very cool, by the way – there are no heat issues to worry about – and the units have been designed to be left switched-on at all times. While products like the SubStation ideally need to be auditioned in the home, we feel confident that 99 per cent of users will find very worthwhile benefits with either or both of these devices. Not only should your system sound fresher and more real, you should also find the quality of sound is more consistent on a day-to-day basis. Given that it can power up to four components, including medium/large power amps, the SubStation LC version is the one to start with. If you like what you hear and already own a large power amp, the HC version (or even a PowerStation) could always be added later. But be warned; we think you'll find the Isol-8 difference addictive!